As uncertainty continues in Israel’s neighboring countries, the Iron Dome system is more important than ever. To better understand its role in Israel’s defense, the Technoion has produced this video. Iron Dome launches interceptors to destroy rockets before they can cause injury, property damage and, most importantly, loss of life. The video features a student from Sderot, a small town in the south of Israel that has been the recipient of countless rocket attacks. It also explains how the system protects Israeli citizens. Obama’s proposal includes $3.1 billion in general military aid for Israel, similar to 2013, plus a separate request for $220 million to finance the Iron Dome anti-rocket defense system…. Obama’s 2014 proposal also allocates $96 million for joint U.S.-Israel research and development projects, including the David’s Sling and Arrow missile defense systems. The overall budget proposal that Obama submitted to Congress on Wednesday totalled $3.8 trillion. The money, if approved during the annual defense budget process, would be on top of $486 million the White House and Congress have requested or added for the system in recent years after formal budgets were submitted. This includes $211 million added in the defense appropriations bill for this year, which President Barack Obama signed into law last month. The $220 million request for fiscal 2014 “is new money, and it is the first time funding specifically for Iron Dome procurement has been requested in our budget submission,” Missile Defense Agency spokesman Richard Lehner said in an e-mail. The article from Bloomberg also outlined how the American Missile Defense Agency requested funds to continue collaborative programs the United States works on with Israel, specifically the David’s Sling and Arrow programs. David’s sling is a shorter range system, and Arrow is intended to intercept long and medium range ballistic missiles. Following his landing in Israel, President Obama arrived in a black SUV to inspect Iron Dome and other air-defense systems lined up outside an hangar on the tarmac. They are a mix of rockets and mobile anti-missile batteries. “I’m a young man. I’m always looking for any chance to walk,” Obama said to Israeli military officials after hopping out of the SUV. Obama listened as an officer explained the functions of an Iron Dome battery, a squat, desert-grey weapon pointed skyward. He then entered what appeared to be a control room. Back outside, Obama shook hands with a line of Israeli officials in front of Iron Dome. He paused again in front of the battery, gesturing with his hands, as an officer spoke to him. Video and remarks after meeting with Peres after the jump. Obama and Israeli Prime Minister Benjamin Netanyahu then walked, in shirt sleeves, to Marine One, for the short flight into Jerusalem. It is an incredible honor to offer this tree to this beautiful garden, and to someone who is champion of the Israeli people and a champion of peace. “And we’re very good gardeners,” Obama added. The two men then began a bilateral meeting inside. Secretary of State John Kerry took a seat to Obama’s right. Ambassador Michael Oren to Peres’ left. President Obama and President Peres met for about 55 minutes at the Israeli president’s residence. They emerged to make brief statements, standing at two podiums on a small stage with three U.S. flags and three Israeli flags behind them. Obama said he reaffirmed to Peres that in the work ahead, Israel will have no greater friend than the U.S. He praised Peres as someone with astonishing vision and a practical-minded politician. Obama said Mr. Peres’ work had planted the seeds of progress, security and peace. We spoke about the Iranian threat, Syria, the peace process for the Palestinians, and change in the Middle East. The meeting was good and President Obama was in a listening mood. On the Iranian threat, we were convinced by the commitment and the determination of the Americans to deal with the issues. President Obama reaffirmed that all options remain on the table. On Syria, the chemical arsenal was mentioned but I cannot say more. On the peace process, it is achievable. We have to resume the negotiations as soon as possible and President Obama agreed with that. President Peres: President Obama, it is a great privilege for me and for the people of Israel to host you here in Jerusalem. It was a real pleasure to sit with a true friend — very knowledgeable, fortunately — and sit candidly and discuss issues openly and freely. After the meeting we just had, I have all confidence that your vision can transform the Middle East. Your vision is achievable. You arrived here already with an impressive record of answering our needs, particularly — and unforgettably — in the domain of security. I want to thank you personally, dear friend, for the long days and for many long, sleepless nights — you know about them — which you spend caring for our country and for our future. We live in an age that is both global and domestic, inseparably. Interest may divide people; vision may unite them. There is common vision uniting us to confront the dangers, to bring peace closer as soon as possible. The greatest danger is a nuclear Iran — so you said, so you do. We trust your policy, which calls to, first, by non-military — to fight by non-military means with a clear statement that other options remain on the table. You made it clear that your intention is not to contain but to prevent. We are trying together to start negotiations with the Palestinians. We already agreed that the goal is a two states for the two people solution. There is no better one, or more achievable one. We consider that the President of the Palestinian Authority, Abu Mazen, is our partner in that effort to stop terror and bring peace. Hamas remains a terror organization that targets innocent people. On our northern border, Iran’s proxy, Hezbollah, continues to stockpile arms and threaten our civilians while they target innocent people across the world. Hezbollah is destroying Lebanon and supporting the brutal massacre of the Syrian people by President Assad. Fortunately, the Syrian nuclear capacity was destroyed. But unfortunately, thousands of chemical weapons remain. We cannot allow those weapons to fall in the terrorists’ hands. It could lead to an epic tragedy. There is an attempt to bring spring to the Arab world. It is an Arab choice. It is an Arab initiative. It may bring peace to the region, freedom to the people, economic growth to the Arab states. If realized, it can lead to a better tomorrow. We pray it will become a reality. I really believe the vision is within skeptics and those who believe in peace. Your voice will encourage belief. You came to us with a clear message that no one should let skepticism win the day — a vision that states clearly that peace is not only a wish, but a possibility. I fully support your call. There is no other way to make the future better. There is no better leader to make it possible. Your visit is a historic step in that direction. We shall journey with you all the way. Thank you. Well, thank you, President Peres, for your very generous words and your warm welcome. It is wonderful to be here once again. I first visited you when I was still a senator and had the opportunity to visit the lovely garden, and for me to be able to bring a tree from the United States that will find a home in that garden I think is symbolic of not only the friendship between our two nations, but between the two of us personally. Mr. President, you once remarked that a prime minister’s job is to rule, a president’s job is to charm. Well, as with all our visits together, I have once again succumbed to your charms and I’m grateful to your hospitality. It is wonderful to be back in Jerusalem, the Eternal City. And I’m pleased to begin my visit with a son of Israel who’s devoted his life to keeping Israel strong and sustaining the bonds between our two nations. President Peres knows that this is a work of generations. Just as he joined the struggle for Israeli independence in his early 20s, he’s always looking ahead, connecting with young people. And I’m especially grateful for the time he allowed me to share with those extraordinary Israeli boys and girls. Their dreams are much the same as children everywhere. In another sense, though, their lives reflect the difficult realities that Israelis face every single day. They want to be safe. They want to be free from rockets that hit their homes or their schools. They want a world where science and technology is created to build and not destroy. They want to live in peace, free from terror and threats that are so often directed at the Israeli people. That’s the future that they deserve. That’s the vision that is shared by both our nations. And that is Shimon Peres’s life work. And, Mr. President, Michelle and I have such fond memories of your visit to the White House last spring, when I was honored to present you with America’s highest civilian honor — our Medal of Freedom. And that medal was a tribute to your extraordinary life, in which you have held virtually every position in the Israeli government. So today was another opportunity for me to benefit from the President’s perspective on a whole range of topics — from the historic changes that are taking place across the region to the perils of a nuclear-armed Iran, to the imperatives of peace between Israelis and Palestinians, to the promise of our digital age. And I should note that one of the advantages of talking to President Peres is not only does he have astonishing vision, but he’s also a pretty practical-minded politician and consistently has good advice in terms of how we can approach many of these problems. I reaffirmed to President Peres, as I will throughout my visit, that in this work, the State of Israel will have no greater friend than the United States. And the work we do in our time will make it more likely that the children that we saw today alongside children from throughout the region have the opportunity for security and peace and prosperity. President Peres I think understands that story well. And so we want to all thank you for all the seeds you’ve planted — the seeds of progress, the seeds of security, the seeds of peace — all the seeds that have helped not only Israel grow but also the relationship between our two nations grow. And I believe that if we tend to them, if we nurture them, they will yield fruit in every hill and valley of this land, not only for the children we met today but for Israelis, for Palestinians, for Arabs across the region. That’s not only good for the children of this region, but it’s good for my children and the children of America. I deeply believe that. And I couldn’t ask for a more wise or more thoughtful partner in that process. I’m very grateful for you hospitality, and I look forward to our continued work in the future. President Obama then traveled to Netanyahu’s Residence for a bilateral meeting that was scheduled to last for 2 hours and 15 minutes. In its story on the development of the Iron Dome missile defense system, The Wall Street Journal reported that President George W. Bush’s Administration gave a “frosty” response to the system when it was first brought to their attention. Israel’s Iron Dome rocket-defense system spent the past two weeks successfully blasting Hamas rockets out of the sky-many in dramatic nighttime explosions-helping to end the recent hostilities between Israel and Hamas in just seven days. The battle to build Iron Dome, however, lasted years and provided fireworks of its own…. Despite initial Pentagon misgivings, President Barack Obama has given $275 million to the project since 2010 with the aim of reducing the rocket threat and eventually bolstering chances of a peace deal by making Israel feel more secure to agree to territorial concessions. For years, Pentagon experts dismissed Iron Dome as doomed to fail and urged Israel to instead try a cheaper U.S. approach. 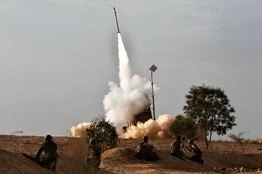 Iron Dome faced similar skepticism at home. But an Israeli mathematician-general, along with a labor-organizer-turned-defense-minister, pushed the project through, overcoming the opposition of some of Israel’s most powerful military voices…. Israel’s Defense Ministry approached the U.S. administration of President George W. Bush with a request for hundreds of millions of dollars for the system. The reception at the Pentagon was frosty, according to current and former U.S. defense officials. Mary Beth Long, the assistant secretary of defense who oversaw the Iron Dome review process, sent a team of U.S. military engineers to Israel to meet with the developers. After the trip, in a meeting in her office, the team voiced skepticism about the technology, citing poor performance in initial testing, Ms. Long said in an interview. Some U.S. military officials argued that Israel should instead consider using a version of the U.S.’s Vulcan Phalanx system, which the Army was deploying in Iraq to try to shoot down incoming rockets, current and former defense officials say. Gen. Gold’s team had already considered and dismissed the Phalanx system. By the end of 2007, Mr. Olmert and Mr. Peretz’s successor as defense minister, Ehud Barak, had both come around to backing Iron Dome…. As president, Mr. Obama tapped Colin Kahl to run the Pentagon office overseeing U.S. military policy in the Middle East. Mr. Kahl found the Iron Dome request on his desk, decided to take another look and had what he later described as a light-bulb moment. ‘Ding, ding, ding. It just made sense,’Mr. Kahl said…. In its final report, presented to the White House in October, the team declared Iron Dome a success, and in many respects, superior to Phalanx. Tests showed it was hitting 80% of the targets, up from the low teens in the earlier U.S. assessment. ‘They came in and basically said, “This looks much more promising…than our system,”‘ said Dennis Ross, who at the time was one of Mr. Obama’s top Middle East advisers. That summer, Mr. Kahl’s office drafted a policy paper recommending that the administration support the Israeli request for roughly $200 million in Iron Dome funding. A few months ago, I wrote an article for the American news outlet Politico in which I explained that the Iron Dome not only saves lives but also prevents war and gives a wider diplomatic window for decision-makers. In response to the article, I received dozens of calls from lawmakers from both sides of the aisle who wanted only to extend a hand and ask what they could do for Israel. From this, I gathered that Americans, like Israelis, understood the logic behind the wise investment called the Iron Dome and for this we are wholeheartedly thankful to President Obama, Congress, the Pentagon, the White House and all the other entities that were involved in the project. The Iron Dome is the embodiment and manifestation of the close relationship between Israel and the U.S.
To read more about the effectiveness of the Iron Dome missile defense system, click here.